The modern world offers many ways for accurate determination of the weather – there are thermometers of different calibers, detailed TV forecasts, Internet sites and special applications, numerous barometers and other gadgets that can easily clog the entire room in a medium-sized apartment.But often times you want to touch the mystery of measuring all the parameters, and feel like an explorer. 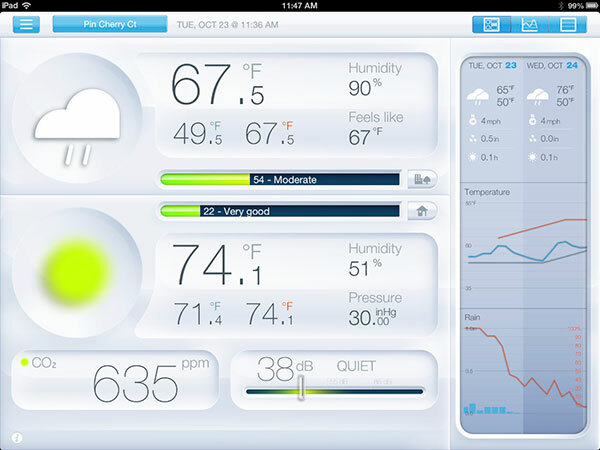 Then to the rescue comes the home weather station – comfortable and functional devices that combine the features of a dozen other instruments. The ability to view the measurement results at any time with your favorite gadget will not be superfluous. 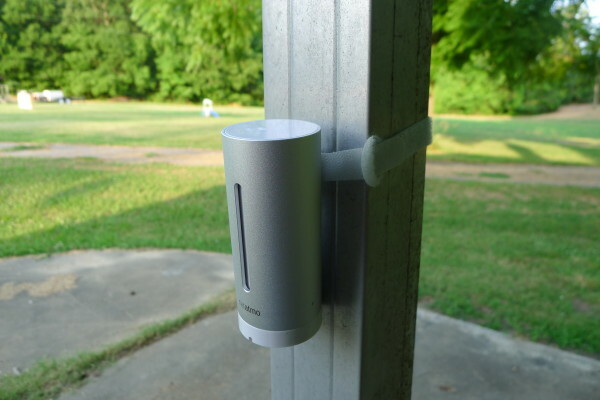 Today will be reviewing the Netatmo Urban Weather Station. Lets see if it so good, as the manufacturer advertise it? The device consists of two parts – internal and external unit, differing only in its height. These metal cylinders that resemble modern cars designs are rounded, with smooth lines and silver color. Well designed, well thought, but not amazing. The form is well thought – the long cylinder does not take up a lot of space, which is especially important inside the house. When the weather station takes a good part of your working desk – it is somewhat impractical, and a small silver object resembling a fashionable lava lamp will definitely complement the interior of a modern room. The indoor unit is equipped with a long vertical slit. Hidden inside is a light, which indicates that the device is working. You can operate the device in various ways with one of them being the manual activation. To begin collecting data simply tap the top cover – the device will start immediately and will begin sending information to the server. One of the units must be mounted outside – backyard or outside of your window. It should be noted that aluminum was used for manufacturing this weather station, so the fear for the integrity of the device is not necessary – most mechanical parts are well covered. Mounting is done with screws (supplied) – cheap but effective solution. For greater reliability the manufacturer has added Velcro strip, which can be used to secure the sensor. There is a small negative – and it is a problem most of the stations form this class has, namely the need to come up with a protective shield. The device, according to the manufacturer, does not like direct sunlight and water. So when installing keep that in mind. The outdoor unit is powered by standard AAA batteries, which can be found in any store. The absent of rechargeable batteries has its obvious advantages, including the consistent need to recharge. The battery life in standard mode is around six months. It depends on how often measurements are made and how often the data is forwarded to the server. If you update the records every few minutes, the batteries will last very long. With the indoor unit, users have the freedom to choose. Those who are not afraid of extra wires can connect it to a power grid and forget about the need to change batteries. The rest may well insert the familiar AAA batteries and change them every few months. The interference on standard band (433 MHz) for the meteorological stations in large cities is colossal. Exchange of data between the units is so bad that it becomes easier to simply measure all variables with some old fashion method. Therefore Netatmo Urban Weather Station works with Wi-Fi, which allows you to forget about such unpleasant problems. The advantage of this solution is more fail-safe reasons – while there is the internet, and the data will be made available. Plus the data exchange rate in wirelessly is very high and the chances of delays are minimal. The most important advantage is increased distance between the internal and external unit. Installing and configuring this weather station literally takes a few minutes – just connect the device, launch the program and wait for instructions. After that you are required to enter you wireless network password, wait a few minutes and the device will start receiving the data. 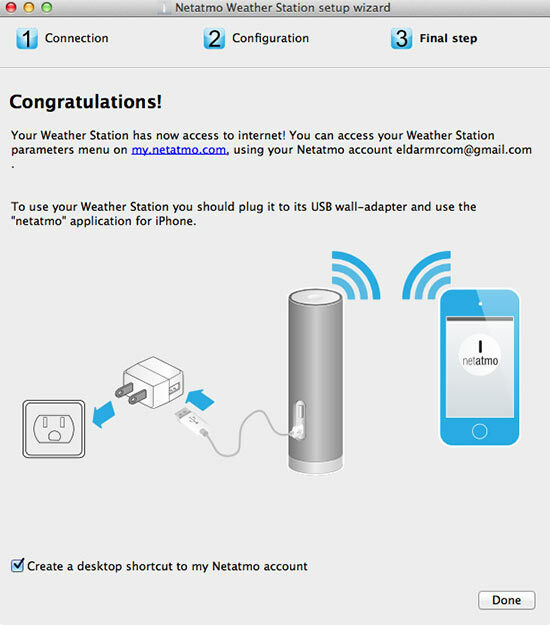 If you happen to change the network, Netatmo Urban Weather Station immediately informs you. All configuration steps have to be repeated, but given that it does not take too much time, that isn’t much of a problem. You will be asked to create a shortcut on the desktop, which later will connect to Netatmo account. The interface is well made so no issues there. The applications available to iOS and Android users are much more interesting. By downloading them from the company store, you can access the Netatmo weather station from anywhere you like as long as there is Internet access. The interface is optimized for any screens size and for your convenience it is divided into several pages. This whole big list is divided onto several screens. What is surprising is that the abundance of information does not prevent the correct perception of data and learning to navigate the application is simple enough. A definite plus of this weather device is that the data is stored on the server, so it can be viewed any time. Thanks to the room unit you can not only see how the weather is changing, but when the noisy neighbors are up, and most importantly how noisy they are. Stored data is enough for a small local weather research and digging into the simple but informative charts is quite interesting. 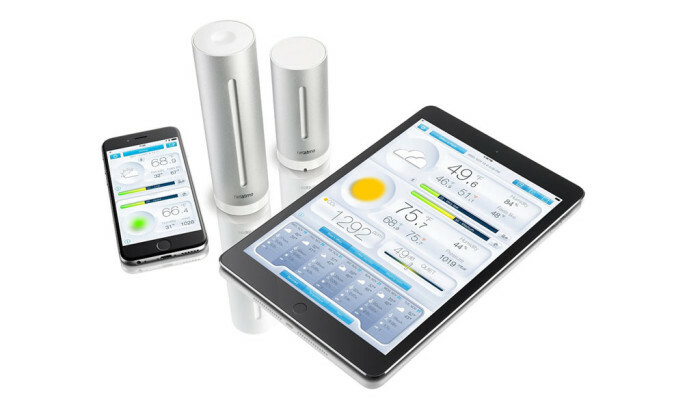 Beyond the interest for the weather Netatmo will be useful to owners of smart home system. The Urban Weather Station takes into account all the necessary parameters to optimize the heating, air conditioning and ventilation. Using this device, you can create an optimal atmosphere in the room long before your arrival from work. It should be noted that the seven say weather forecast is working with third-party applications. In general, the function is interesting, but it cannot provide very accurate information, as well as quality forecast. Much more interesting is the ability to analyze current variables. Using the current data Netatmo can calculate what the weather will be in the next day. The surprising part is that the prediction is very accurate and it can be trusted. Of course, exceptions are out of the ordinary situation, such as dramatic changes due to a storm. In general, the presence of a Netatmo weather station in your house can be justified, and it is not just high-tech overkill. It has all the necessary everyday functionality (plus CO2 and noise), the ability to make quick measurement from data inside and outside, as well as convenient, and easy to use app for any mobile device. All these advantages easily cover the minor cons that Netatmo has.